Cooper’s great aunt Janet is recovering from recent hip surgery. What better way to help someone heal than a super cuddly Cooper. Apparently Nemo, the cat, usually runs with visitors, but he was very happy to hang out when we were there. It is hard to capture a photo of all 3 of them though. 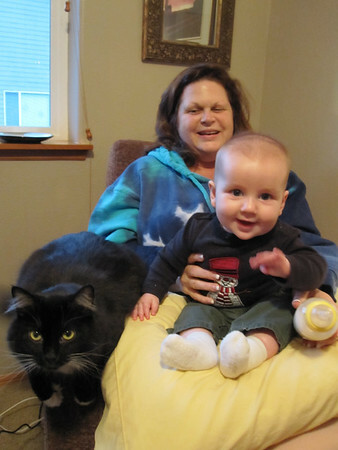 Janet is fantastic with babies and Cooper wouldn’t stop giggling with all of the loves she was giving him.